Brush fire season is here and Collier County fire crews are preparing for the worst. Agencies across the county will use an empty building to practice reading fire behaviors and smoke patterns. Kyle Rambosk, a firefighter for the City of Naples, said the live fire training is a helpful tool to prepare for the flames. “You go in, you get in a few feet, then you cant see visibility goes down, (and) once you lose that you’re relying on your senses,” Rambosk said. 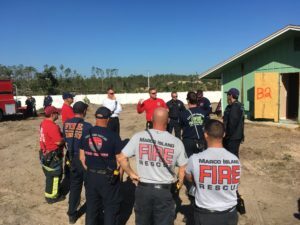 Greater Naples Fire Chief Kingman Schuldt emphasized the importance of training after the Lee Williams fire scorched thousands of acres and prompted hundreds of evacuations. “The Lee Williams fire was a year ago this week and we lost four homes …this wildland interface you can see how close it encroaches to the home,” Schuldt said. Lt. Greg Pacter, in the command center, communicates with the firefighters participating in the training exercise to ensure it goes according to plan. “We have all the command positions on the board here, everyone swet in ready position, (and) we have water supply checked back up water supply just in case things go wrong,” Pacter said. The operation prepares crews for house fires and brush fires. Rambosk said one of the most challenging components to fighting a fire is the heat from the flames. “The heat will get you no matter what you cant train for the heat,” Rambosk said.